When it is available and you can afford it, it is so worth buying local organic meat. It really does taste and grill exponentially better. At your favourite butcher or you local market, look for organic, hormone or anti-biotic free meat. I tend to grill beef, chicken, lamb and pork the most. I find them optimal for the grill. I suggest buying cuts WITH the bone. The flavours that come from the marrow when grilled slowly are just amazing. As my papa says, “the closer the meat is to the bone, the sweeter it is.” …sweet meat and bone, got it. Also, buying your cuts and freezing them is not a crime. Go ahead, just defrost in the fridge a few days before. + chicken: whole, sliced down the breast bone, and flattened. ** all meats ground make for excellent burgers too, especially fresh lamb. If you have space by a window or balcony this summer (urban gardening) or if you have a full garden, grow your own basil, chives, italian parsley, thyme, and rosemary. They are cheap and relatively easy to take care of (basil is a little more difficult). 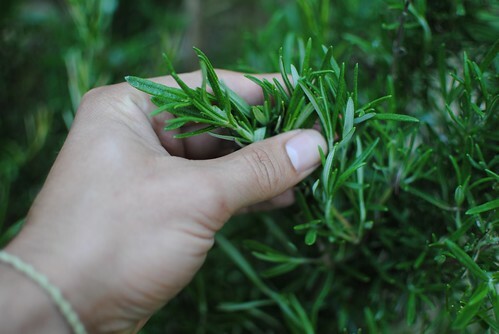 For Lamb I like finely chopped rosemary and thyme. Make sure you take your meat out of the fridge at least an hour before you intend to grill it. 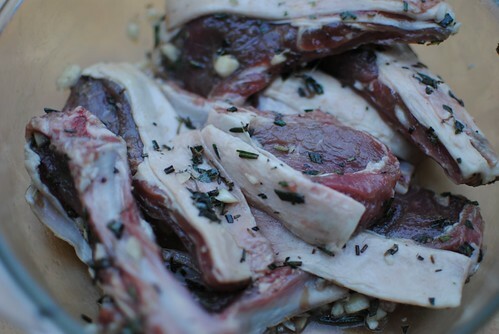 This allows the meat and marinade to come to the atmospheric temperature. This allows the meat to “relax” from it’s cold state when it was in the fridge. Throwing cold meat on the grill is not a good time! + don’t flip your meat (too much) – once is oven enough, as colour and even cooking is your goal here. + watch your meat and watch your heat – grilling isn’t something you just slap on and go type thing. If you burn or dry a good piece of meat out, no one will come back to your BBQs. + give your meat some colour and make sure it has a good amount of heat to tackle when it first hits the grill. For steak, flip when you see the fatty edges folding or blood coming through the top of the un-grilled side. Grill about 1/2 of the time as the initial side. + gauge the thickness of your meat, that will determine your grill times. + practice makes perfect. Don’t be afraid to make mistakes, it’s how we learn. Now you are ready to organize your fire. I am working with a small hibachi, something my father has been using to cook since I was a wee kid. Say what you will about charcoal and carcinogens etc, nothing can beat the flavours produced by a soft burning red coal. The fat of the meat crisps and renders, locking in the flavours and sealing the deal of a perfect grilled meal. Anyways. 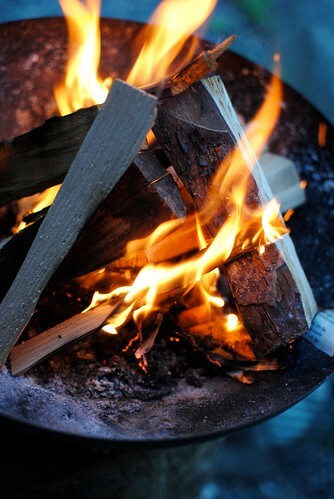 Burn your wood, or coals to a point where the flame is GONE. Flame is not your friend on the grill, ever! 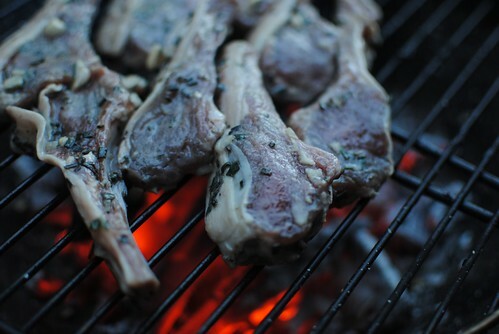 The coals produce a nice consistent heat that will grill your meat to perfection (with proper supervision, of course). Remember, gauge the amount of coals and heat you will require on the meat you will be using and the length of time you intend to cook it. The lamb ribs I had were so small and delicate, so 2-3 minutes on each side would be sufficient. Sometimes the heat does not distribute evenly with a hibatchi and some meat will be cooking faster than others. Always gauge your heat with a little over the grill palm test, and with constant supervision. Any more and I would have been eating boots. Also, tongs are your friend. They are by far my fave grilling tool. I love a fresh summer salad with my grilled meat. 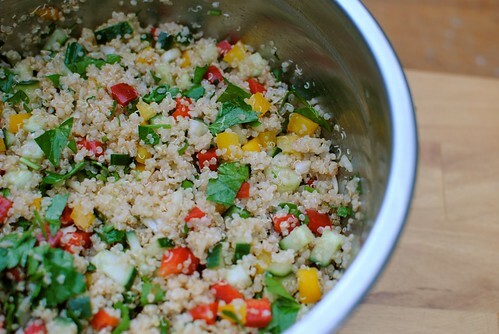 Try my summer quinoa salad! 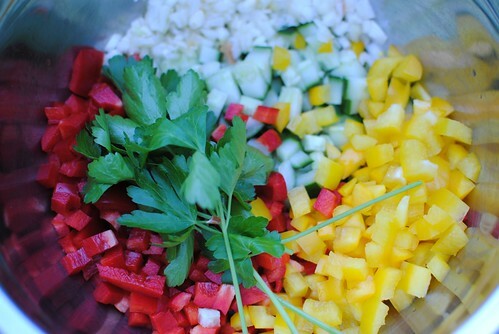 Add all diced veg to a large bowl. When making a salad with a base such as quinoa or couscous, remember to dice your veg. A general rule of thumb when cooking is, keep the size of your ingredients consistent. Add lemon juice, salt, cinnamon, cayenne and oil and toss. Then add cooled quinoa. And lastly the chopped parsley. Mix and you are set. Half of your meal is done! Remember, summer salads are supposed to be fresh and light on the palate. Don’t over load the oils. Sometimes, lemon juice is often enough of a dressing with a splash of olive oil and honey. Serves well with a Merlot. I chose my favourite, Sandhill Merlot 2008, Okanogan, BC. The fresh salad with a hint of spice from the cayenne pairs well with the flavourful rosemary grilled lamb ribs. The merlot serves to compliment with deep cherry and casis with a soft tannin that embellishes the spicy flavours of both the salad and the finish of the wine. Enjoy! Happy summer & keep on cookin! 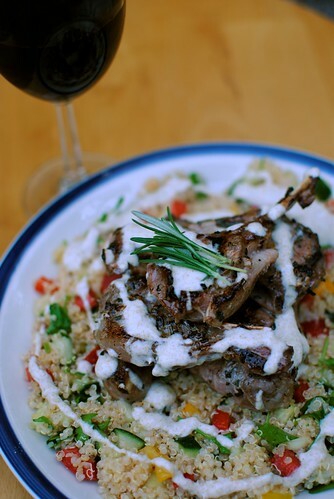 yummy lamb.. Quinoa is refreshing too. Oh, more wine please! Ty you are so gay. 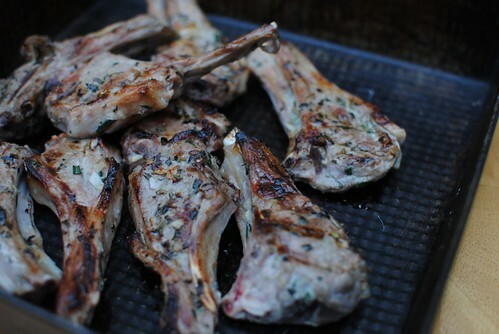 YYYYUUUUUMMMMmmmmm I love lamb with rosemary and thyme!